The NBCOT exam is a stressful and overwhelming challenge for everyone. Common pitfalls when studying for high-stakes exams can range from not leaving enough time to study, to having decreased self-confidence, to wasting time by focusing on reviewing material that is already a strength. Making a plan with a NBCOT study schedule can help. The sheer fact of where to begin studying (also known as analysis paralysis) can even hinder the process. Although there is no one tried and true way of studying for the NBCOT exam, having a solid study plan will help you stay on track and excel. Look below for a clear solution for what to invest in for exam preparation material and for an eight-week NBCOT study schedule. If you have not yet registered for your test, review crucial information in 5 Things You Must Know About the NBCOT Process. 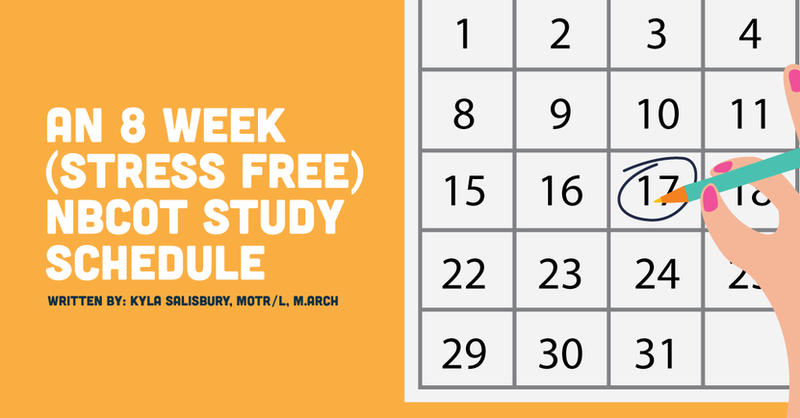 We will start with a list of potential study materials for your NBCOT study schedule. We have chosen to list several study materials. By no means is it necessary to purchase and study all listed materials.